The Lexus NX 300h S is a hybrid SUV with front-wheel drive and a sales proposition that takes a little figuring out. Jonathan Crouch reports. Bringing a sleek hybrid crossover to market for around £31,000 is a tough assignment but Lexus has pulled it off with the improved NX 300h S. It sends drive to the front wheels but makes no pretences about any off-road prowess. It'll manage better than 56mpg and packs a 195PS punch. That's quite a gauntlet thrown down to rivals. Let's imagine you'd just directed over £30,000 at your car dealer and in return were rewarded with an SUV that was all new car smell, tyre black, gleaming alloys and paint so lustrous you could read the time on your watch in its reflection from six feet away. Clearly the first thing you're going to do is to see how it handles being lodged up to its axles in mud. Or not. Probably not, as it goes. It's a perennial complaint of sniffy motoring writers that these SUVs never venture off the blacktop, despite their manufacturers compromising their on-road abilities to enable them to do just that. So what do we think of the concept of a front-wheel drive SUV that's got no ambitions of ever scraping its sump? It ought to be welcomed as something a bit more sensible and pragmatic, right? No. They're usually derided as cars for posers and wimps. Hoping to change all that is Lexus with its uncommonly cerebral NX 300h S.
Yes, you can buy the NX 300h with all-wheel drive, but to be honest, it's hardly any more capable in the rough stuff. This NX 300h S is powered by the proven Lexus 2.5-litre petrol engine, generator, motor and battery with a total system output of 197PS, doing without the additional electric motor that sits atop the rear axle in all-wheel drive NX models. It also gets sprung-weight damping control to increase ride comfort and handling stability by reducing pitching when driving on uneven surfaces. It'll sprint to 62mph in a reasonable 9.3 seconds and keep running on to 112mph. The NX is seriously stacked with gear, even in this entry-level S trim. You'll find LED low-beam headlights and daytime running lights, the Pre-Crash Safety system and Adaptive Cruise Control, dual zone climate control, a Lexus Media Display with Remote Touch controller, a DAB digital radio driving eight speakers, a USB port, electric folding door mirrors and 17-inch alloy wheels. Then there's safety gear like Vehicle Dynamics Integrated Management, Hill Assist Control and eight airbags. You'll get your hands on one from around £31,000 for the NX 300h in S trim which seems extremely good value for money, given that you pay more than that for a 150PS diesel Toyota RAV4. Satellite navigation isn't fitted as standard and Lexus still charges a decidedly old-school fee of around £1,000 for the base system. Metallic paint will also set you back a fairly hefty £645. The front-wheel drive car edges a small but noticeable advantage in terms of efficiency over its pricier all-wheel drive siblings. Where you'd see 54.3mpg, itself a respectable figure for such a chunky crossover, the S variant edges that out to 56.5mpg. Likewise, emissions nudge down from 121 to 116g/km and that extra banding might make all the difference, as might the fact that the S squeaks in under the £30,000 limit that some fleet managers impose. Residual values ought to stand up well as a result of not only the NX's economy but also Lexus' legendary reliability. This has long been the quiet ace in the hole for the marque; its cars running costs pared right back even against the big German brands by dint of strong retained values. Should you want a BMW X3 or Audi Q5-sized vehicle, you're not exactly starved of choice at the moment. Limit the budget to £31,000 and the choices become a lot less exciting. 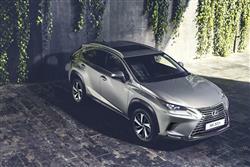 That's why we're fairly confident that this entry-level S version of the Lexus NX has a real chance. Even as the starter NX, it's rammed with standard equipment and it's not as if you're buying something with an outdated nail of a diesel engine in the nose. Instead, you get a clever hybrid system that offers reasonable refinement and very good economy. Clearly, its chances of success hinge on the public perception of a front-wheel drive 'Crossover' vehicle. Let's face it, this one isn't mocked up as an off-roader. It's more like an estate with the sort of high seating position that makes many drivers feel comfortable. Lexus has built something smart and pragmatic here. It might well reap the benefits.